This article explores the rise of Privacy by Design (PbD) from the basic framework, to its inclusion in the GDPR, to its application in business practices and infrastructure especially in the wake of Artificial Intelligence. We had the pleasure of sitting down with Dr. Ann Cavoukian, former 3-Term Privacy Commissioner of Ontario, and currently Distinguished Expert-in-Residence, leading the Privacy by Design Centre of Excellence at Ryerson University in Toronto, Canada to discuss this massive shift that will upend current business practices. We’ve also sought responses from top execs from AI start-ups, and enterprise to address the current hurdles and future business implications of Privacy by Design. This article includes contributions from Scott Bennet, researching privacy and GDPR implications on emerging technology and current business practices. I call myself an anti-marketer, especially these days. My background has predominantly come from database marketing and the contextualization of data to make more informed decisions to effectively sell people more stuff. The data that I saw, whether it be in banking, loyalty programs, advertising and social platforms — user transactions, digital behaviour, interactions, conversations, profiles — were sewn together to create narratives about individuals and groups, their propensities, their intents and their potential risk to the business. As data becomes more paramount and as AI analyzes and surfaces meaning at greater speeds, the danger of perpetuating these biases becomes even more serious, and will inflict greater societal divisions if measures are not put in place and relentlessly enforced. Recently, I met my maker. Call it atonement for the many years I manipulated data as a marketer. We had the honour of talking Privacy with an individual I had admired for years. Dr. Ann Cavoukian, in my view, will drive a discussion across industry that will make business stand up and listen. Imagine going to your doctor, and he tells you that you have some signs of cancer developing and says, “We’ll see if it gets worse and if it does, we’ll send you for some chemo”. What an unthinkable proposition! I want it to be equally unthinkable that you would let privacy harms develop and just wait for the breach, as opposed to preventing them from occurring. That’s what started PbD. When you have an increase in terrorist incidents like San Bernadino, Charlie Hebdo attacks in Paris, and in Manchester, the pendulum spins right back to: Forget about privacy — we need security. Of course we need security — but not to the exclusion of privacy! I always say that Privacy is all about control — personal control relating to the uses of your own data. It’s not about secrecy. It drives me crazy when people say ‘Well, if you have nothing to hide, what’s the problem?’ The problem is that’s NOT what freedom is about. Freedom means YOU get to decide, as a law-abiding citizen, what data you want to disclose and to whom — to the government, to companies, to your employer. Privacy is not a religion. If you want to give away your information, be my guest, as long as YOU make the decision to do that. Context is key. What’s sensitive to me may be meaningless to you and vice versa… At social gatherings, even my doctors won’t admit they’re my doctors! That’s how much they protect my privacy. That is truly wonderful! They go to great lengths to protect your personal health information. Look at Germany. It’s no accident that Germany is the leading privacy and data protection country in the world. It’s no accident they had to endure the abuses of the Third Reich and the complete cessation of their privacy and their freedom. And when that ended, they said, ‘Never again will we allow the state to strip us of our privacy — of our freedom!’ And they have literally stood by that. We like to say that we grew up with the Internet, thus we think that the Internet is all grown up. But it’s not. What is intimacy without privacy? What is a democracy without privacy?…Technology makes people stupid. It can blind you to what your underlying values are and need to be. Are we really willing to give away our constitutional and civil liberties that we fought so hard for? People shed blood for this, to not live in a surveillance society. We looked at the Stasi and said, ‘That’s not us. We can have privacy and meet business interests, security and public safety … it can’t be an either/or proposition. I think it’s the best way to proceed, in a positive-sum, win/win manner, thereby enabling all parties to gain. Cavoukian contends that Principle #2, Privacy by Default is critical and, of all the foundational principles, is the hardest one since it demands the most investment and effort: with explicit requirements that change how the data is collected, used and disclosed, and will result in data policy and process alterations including new user-centric privacy controls. The controller shall no longer process the personal data unless the controller demonstrates compelling legitimate grounds for the processing which override the interests, rights and freedoms of the data subject. The business must be more explicit and go much further, beyond the traditional disclosure and terms of service. Purpose specification and use limitation require organizations to be explicit about the information it requires, for what purpose, and must elicit consent specifically for that purpose and that purpose alone. Later on, if a secondary use transpires, the organization will require the user consent once again. If disclosure is key to transparency, businesses will need to find a way to do this while mitigating consent fatigue. While this statute will have exceptions like data that establishes the data subject as an entity: through health records and banking information, behaviour, transactions, future analysis in profiling, and contextual models are fair game for “the right to be forgotten.” The advent of the GDPR has provided business a glimpse of the potential impacts where companies experienced customer record volumes drop an average of 20% for customers who did not explicitly opt-in. This is a truly user-centric system. Make no mistake, Privacy by Design will challenge current practices and upend current infrastructures. 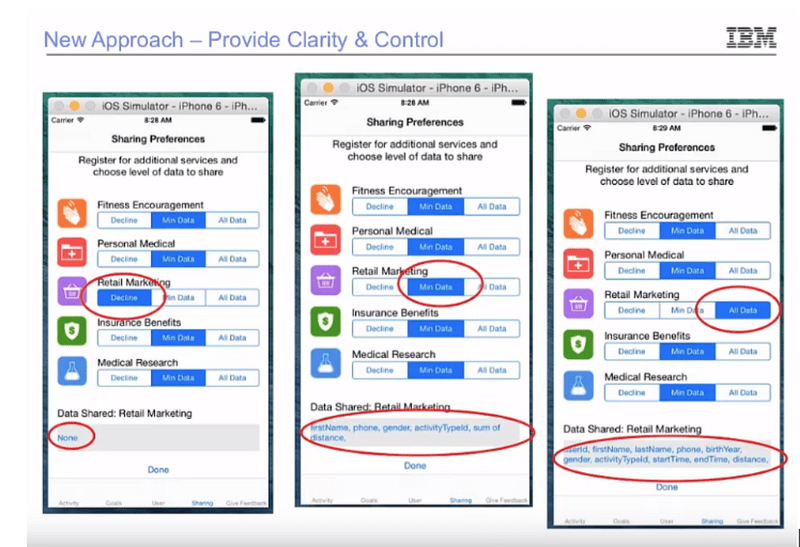 This privacy UI simulation (IBM: Journey to Compliance) displays how potential user controls will work in real time and the extent to which the user can grant consent based on different contexts. This level of user access will require a data repository to purge user information, but must be configured with the flexibility to redeploy the data into systems down the road, should the user decide to revert. Can Privacy by Design Create a Positive-Sum Existence for Business? If you had asked me a year ago, I would have argued that Privacy by Design is not realistic for business adoption, let alone, acceptance. It will upend process, structure, and policy. However, within the mandate of GDPR this is an inevitability. We asked Ann Cavoukian to consider business practices today. Both Google and Facebook have received enormous fines in wake of the GDPR to the tune of $9.3 billion. Because of the recent Cambridge Analytica data breach, Facebook is investing millions in tools and resources to minimize future occurrences. Its recent Q2 stock plummet took the market by surprise but for Zuckerberg, he made it clear they would be taking a performance hit for a few quarters in order to improve the platform for its users… not for its shareholders. While they are a beacon of how companies should behave, this clear “ask forgiveness later” model negated any appearance that this strategy was nothing less than altruistic. We have prepared for the past 18 months to ensure we meet the requirements of the GDPR. We have made our policies clearer, our privacy settings easier to find and introduced better tools for people to access, download, and delete their information. In the run up to GDPR we asked people to review key privacy information which was written in plain language, as well as make choices on three important topics. Our approach complies with the law, follows recommendations from privacy and design experts, and is designed to help people understand how the technology works and their choices. Cavoukian pointed to a study by IBM with the Ponemon Institute that brought awareness to the cost of data breaches: It reports that the global average cost of a data breach is up 6.4 percent over the previous year to $3.86 million per incident. On a per record basis, the average cost for each record lost rose by 4.8% to $148. As Cavoukian points out, these costs will continue to rise if you maintain Personally Identifiable Information (PII) at rest. How Do You Address the Advertisers Who Successfully Monetize Data Today? The value of data is enormous. I’m sorry but advertising companies can’t assume they can do anything they want with people’s data anymore. I sympathize with them. I really do; their business model will change dramatically. And that is hard to take so I genuinely feel bad for them. But my advice is: that business model is dying so you have to find a way to transform this so you involve your customers, engage them in a consensual model where benefits will accrue to customers as well. Context is key. Give individuals the choice to control their information and gain their consent to exchange it for something they value from you. Mary Meeker’s “Paradox of Privacy” points to the consumer’s increasing demand for products and services that are faster, easy, convenient and affordable. This requires systems that can leverage personal information to make this a reality for the consumer. Increased customization is the expectation but brings with it increased business risk. As long as current business practices persist, according to Cavoukian, it leaves their business vulnerable to, as we’ve witnessed, incessant data breaches and cyber attacks. Equifax and Target are two cases in point. Communication with the data subject needs to be a win/win (positive sum). Can the business provide the necessary value, while respecting the choices dictated by the individual? When AI becomes more pervasive this will become even more challenging as streaming data will require more real-time interfaces and applications that allow access and individual configuration of data types across various contexts and vertical uses. Data is clearly one of the most valuable assets in the world today — especially with the growing importance of artificial intelligence (AI) which relies on massive amounts of data. Data privacy needs to be incorporated into the fabric of how these technologies work in order for society to get the most benefit from AI. To me, data privacy means having the ability to control when and why data that you own is used — not the ability to keep it secret which is a far easier task. For that to happen, there needs to be open and transparent marketplaces where people and companies can sell data that they create, as well as a consistent set of regulations for how companies can use data. Sooner or later I envision a data marketplace — a supply side and a demand side. Today, companies leverage data at the user’s expense and monetize it. The end user does not experience any real economic benefit. Imagine a time when data becomes so valuable the individual can have full control and become the purveyor of his/her own information. As an entire ecosystem I feel we are just now coming to terms with the evolution of value exchange that was established between end users and digital publishers and software developers starting in October 1994 when Hotwired.com ran the internet’s first banner ad. The monetization of audiences through advertising and wide-spread data harvesting of the same audiences in exchange for ‘free’ content or software has enabled the meteoric growth of the internet and the businesses that are built around it but has also enabled massive amounts of fraud and nefarious activity. Thankfully we are at a tipping point where corporations/brands and users alike are taking back data ownership and demanding transparency, as well as consent and accountability. Defining and managing the core tenets of this value exchange will become even more important (and complex) in the future with the rise of new technologies and associated tools. So the time is now to get it right so both businesses and users can benefit long term. The debate between privacy and security is a misleading one, as the kind and amount of data shared with private companies and the government need not and should not be the same. AI has been vilified in data privacy issues but the same technology (especially the upcoming metalearning approaches) can be used to ensure safety while preventing unwanted marketing and surveillance. If the monitoring tools (by design) were made incapable of reporting the data to authorities, unless there was a clear security threat, such situation would be like having nearly perfect privacy. It is technologically possible. Also, we need to merge privacy with profits, such that by and large, companies are not at odds with the regulatory authorities. This means there needs to be smarter media and social platforms, which present more choices for data sharing, choices that are acceptable between the end customer and the platforms. If there was better control and understanding of how personal data is being used, I believe people would be willing to be more open. The balance is ensuring there is a fair value exchange taking place. In exchange for my data, my experiences become better, if not in the present but in the future. And as long as this is a trusted relationship, and people understand the value exchange then people are open to sharing more and more information. I am happy that Facebook, Amazon, and other platforms are aware that I am a male between 35–45 with specific interests in travel and pets, but no interest in hockey or skateboarding. Or that based on certain movies I watch, Netflix makes recommendation on what other types of content I would be interested in to keep me more entertained. And maybe that data is used elsewhere, with my permission to make experiences better on other platforms. The battle for data in an increasingly competitive consumer landscape is to increase engagement using personalized insight they have gleaned about their customers to ultimately create better experiences. I am certain many people do not want to go back to the anonymous web where all of us are treated largely the same and there was no differentiation in the experience. Everyone agrees the regression to anonymity is not plausible nor tenable. When I have these conversations with CEOs, at first they think I’m anti-business and all I want to do is shut them down. It’s the farthest thing from my mind. You have to have businesses operating in a way that will attract customers AND keep their business models operating. That’s the view I think you should take. It has to be a win/win for all parties. Do you have a data map? I always start there. You need to map how the data flows throughout your organization and determine where you need additional consent. Follow the flow within your organization. This will identify any gaps that may need fixing. Perhaps this is the view that companies should take. Ann Cavoukian maintains that those who have implemented PbD say it builds enormous trust. When you have a trusted business relationship with your customers, they’re happy to give you additional consent down the road. They just don’t want the information flowing out to third parties unknown. I tell companies if you do PbD, shout it from the rooftops. Lead with it. Tell your customers the lengths you’re going to to protect their privacy, and the respect you have for them. They will thank you in so many ways. You’ll gain their continued loyalty, and you’ll attract new opportunity. 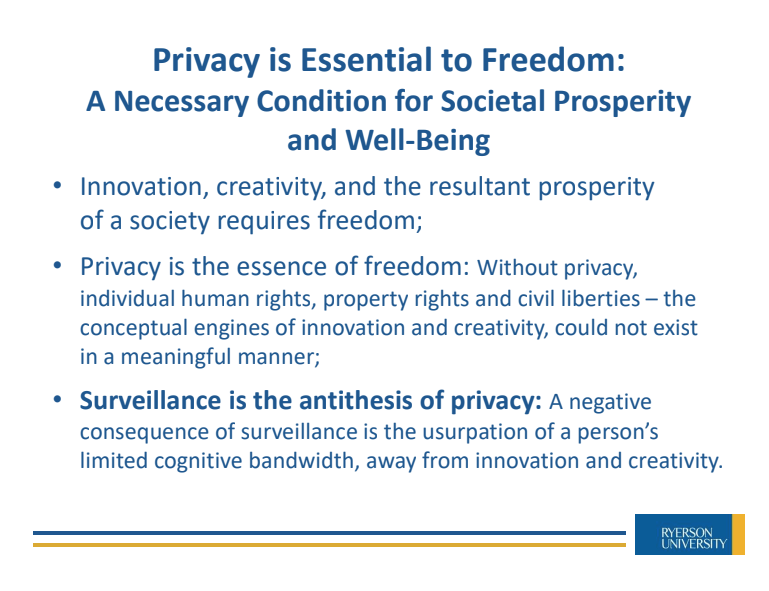 I say to companies who see privacy as a negative, saying that it stifles creativity and innovation: ‘It’s the exact opposite: Privacy breeds innovation and prosperity, and it will give you a competitive advantage. It allows you to start with a base of trust, which steadily enhances the growth of your customers and their loyalty. Make it a win/win proposition! Ann Cavoukian has recently launched Global Privacy and Security by Design: GPSbyDesign.org, an International Council on Global Privacy and Security. 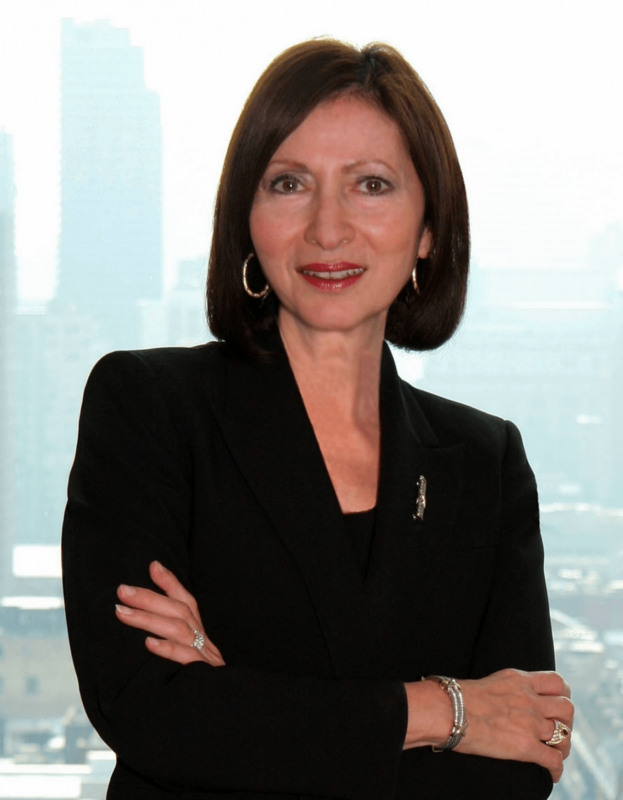 For more information on Ann Cavoukian, please go to Privacy by Design Centre of Excellence, at Ryerson University. This article first appeared on Forbes: Part 1 and Part II.